What is the Value2Me (as experienced, after trial)? Why should the seller accept that as fair compensation from me? Agreeing to treat each transaction as a trial offer, in which any Value2Me price I (the buyer) choose to set is final. Deciding based on my Value2Me price--and the reasons I give for it--whether I am being fair enough that the seller should continue making such offers to me going forward. This balance -- of buyer-set Value2Me versus seller-controlled judgment of the buyer's fairness as the condition for continuing the relationship -- provides the central dynamic for a new invisible hand. All else is implementation details. Renaming FairPay? This new model has been widely discussed under the name FairPay (derived from Fair Pay What You Want), but it seems Value2Me may more positively capture the focus on value as it is uniquely perceived by each consumer. This post seeks to test re-casting the concept in those terms, and to request your opinion on that. "Value" is the core of all economic value exchange -- we all want value. "Value2Me" focuses that on the individualized, personalized nature of value perception. I submit that value to me is the essential criterion for economic exchange, and that the Value2Me process dialog is the best sustainable basis for a new economics. Value2Me is the best possible sustainable price -- free or other lower prices are nice for consumers, but not sustainable. Seller-set prices almost never reflect Value2Me -- they are usually either too high or too low for most buyers. The digital economy helps make Value2Me feasible because it enables infinite replication of products/services at almost no cost ("value"), and facilitates mass-customization ("2me"). Sellers can afford to continue to make Valeu2Me trial offers to a buyer as long as the buyer does not exploit them unfairly. Any revenue above marginal cost is profit. The only limit needed is to nudge each buyer to pay a price that fairly reflects their personal Value2Me, for that transaction, even if other buyers have a higher or lower Value2Me. The dialogs are designed to elicit that Value2Me, and to make it clear that it may differ from the value to other buyers due to different contexts: different usage levels, features, needs, benefits, and ability to pay. Suggested prices based on that experience can also be provided, so buyers have some guidance of seller expectations (an "anchor" in behavioral economic terms). Cost data can also be provided (as it depends on usage), so buyers can factor in a fair profit level. The "Why" of the buyer's Value2Me response would be relative to the usage, the costs, and the corresponding seller-suggested price. Buyers who stretch the limits of fairness in setting Value2Me can be warned that if they are not more reasonable in the future, they will lose the privilege of paying based on Value2Me, and will have to buy at a conventional fixed price. Making this work as well as possible will take sophisticated automation to track buyer Value2Me, and "choice architectures" that apply behavioral economics to nudge buyers to fully recognize that value--with consideration to the costs of providing it (and to a fair profit). That is outlined elsewhere in this blog and the FairPay Web site. But the core idea is simple, and the process can be made simple and intuitive. The term "Value2Me" also helps in emphasizing how this new perspective on commerce not only makes pricing and marketing more efficient, but can empower more effective product design and development. It focuses sellers on measuring perceived value, and on seeking to deliver maximum value to each of their customers on a customized basis. It facilitates a more adaptive and dynamic product development process that seeks to offer each customer the features and services that he needs to maximize his Value2Me. In the past commerce relied on fixed prices that had to dance around the question of Value2Me -- now it can zero in on it. Value2Me for B2C! All of this is consistent with previous discussions using the term FairPay. It is just a subtle shift of emphasis -- a use of words that may have a more positive appeal to consumers, and a more direct suggestion of the basis in value as perceived by each buyer. Comments are invited! And please take our survey on the new name. Facebook lost half its market cap because of doubts about the viability of ads as the world goes mobile. Advertising has its place, where it is non-intrusive, and when it provides valued information relevant to my current context. But that is unlikely to fully pay for the services consumers want. Similar problems are at crisis level in newspapers, video, and music. Instead, we look to advertising, or to selling data about consumers, both of which are largely opposed to the interests of the consumer. But consumers are coming to realize that "if you're not paying for something, you're not the customer; you're the product being sold." I suggest that by rethinking how we pay for services, we can find a much better solution. Freemium offers a hint of the answer-- give away some product to get users to see the value and agree to pay for a service they find useful. But this still fails to match widely varying usage patterns, value perceptions, and abilities to pay. The concern is that the user will not be fair, and will understate what he is willing to pay--or will fail to appreciate the cost of service. But we are in an era of relationship commerce – now we can build personalized relationships on mass scale. The solution is to build relationships with customers based on dialogs about value -- so that we can maintain relationships with those that set values fairly, nudge them to recognize the value, and cut off relationships with those who are unfair. The same technologies that enable ad targeting, individualized merchandizing, and automated customer service can enable this too. I have been talking to companies of all sizes about just such an approach -- I call it “FairPay” (short for “fair pay what you want”). All it takes is some willingness to empower your customers, and some experimentation. Is that any more than we should expect in this new age? "Creating Shared Value," the influential 2011 HBR article by Michael Porter and Mark Kramer, points to the need to reinvent capitalism with broader ideas about value creation that will unleash a wave of innovation and growth. They propose that "creating shared value represents a broader conception of Adam Smith's invisible hand." 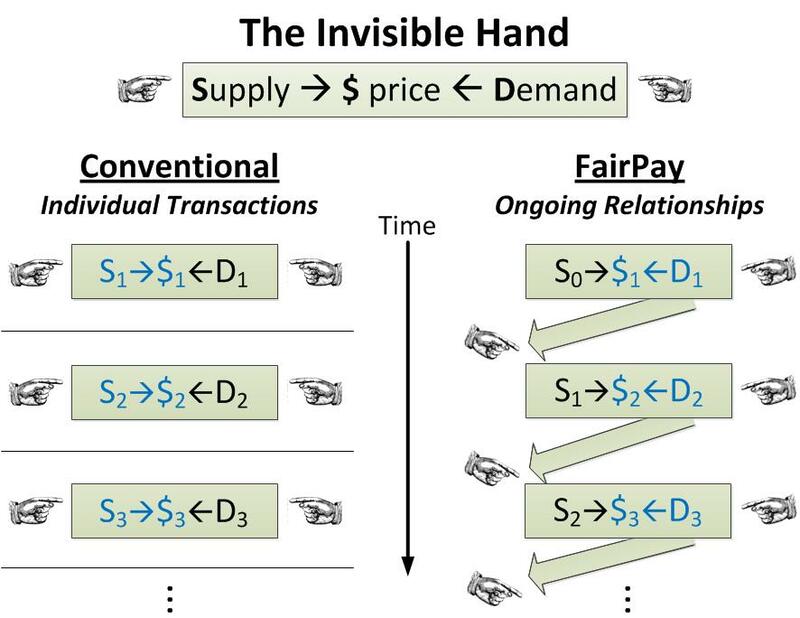 I suggest that the FairPay revenue model provides a new market regime that reorients the invisible hand toward shared value, one that can be operationalized in business today, to offer an entirely new micro-economics for profit-seeking business transactions. The moment for an expanded view of value creation has come. A host of factors, such as the growing social awareness of employees and citizens and the increased scarcity of natural resources, will drive unprecedented opportunities to create shared value. We need a more sophisticated form of capitalism, one imbued with a social purpose. They suggest what we need is not "a redistribution approach," but one for "expanding the total pool of economic and social value. FairPay turns the force of the invisible hand to span ongoing relationships. It guides pricing to create shared value between customers and businesses over long-term relationships (in which customers have a say in the creation of shared value). It looks beyond one-time transactions, to ongoing dialogs about value. 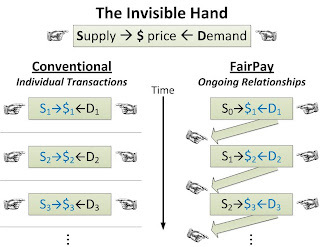 Adam Smith's invisible hand works at a transaction level: it optimizes the balance of supply and demand in terms of prices for large numbers of individual transactions. Transaction prices drive supply and demand into balance, by shifting supply or demand until balance is achieved. This invisible hand does not know or care about repeat business or shared value (except as it affects demand in aggregate). FaiPay turns the invisible hand on its side, to work over time, at the relationship level: it optimizes the balance of supply and demand in terms of prices over time, with respect to individual customers. Relationship pricing is balanced through an ongoing series of pricing conversations, to achieve an agreed upon level of shared value in each of a multitude of ongoing buyer-seller relationships. Shared value is integral to these pricing conversations. For each transaction, the buyer is given the full power to set prices based on the value actually received (Fair Pay What You Want). This is done retrospectively, when the value is known to the buyer. The seller must accept the buyer's price for that transaction, but the seller holds the power to decide if the buyer's pricing is fair enough to want to extend the relationship by continuing to make FairPay offers for future transactions (considering what has been learned about the buyer's pricing behavior and reasons). Buyers have full freedom regarding the pricing of single transactions, but have the incentive to be fair to sellers and divide the shared value surplus in a way that is fair to the seller. They are also invited to give reasons for their pricing that indicate why they think their perception of shared value is more or less than the seller has suggested. Based on guidance from the seller on suggested prices, costs, usage, social norms, and the buyer's reasons, both sides can learn whether and how they can agree over time on criteria for fair pricing that creates the maximum shared value (even if they do not agree on each transaction). Sellers yield power over a limited number of individual transactions, but gain new power to truly understand the value they provide to individual sellers in each transaction, and to engage in a substantive dialog with their customers about that value and how they should share in it. Sellers manage the "choice architecture" that frames the value proposition and the factors to be considered, and can signal what buyer pricing behaviors they accept as fair or unfair. The seller learns how loosely or rigidly to manage each customer relationship to create profit and grow its share of the pie. The new invisible hand of Fairpay emerges from this balancing mechanism for discovery and maximization of shared value between buyers and sellers over time. FairPay pricing can be used in combination with conventional pricing as a back-stop, and positioned as a privilege offered to those who desire a relationship based on shared value and respect for the obligations of fairness that entails. Sellers can manage the "choice architecture" by using premium tiers and perks as rewards, and the threat of withdrawal of such premiums as penalties, to nudge buyers to price at the highest levels the buyers consider justifiable. Sellers also hold the threat of complete withdrawal of future Fairpay privileges (returning an "unfair" buyer to fixed pricing for future transactions) as a powerful incentive to deter abuse. The essence of Fairpay is that buyers and sellers engage in a continuing individualized dialog about shared value--both at a personal and a social level--as actually realized in every transaction. FairPay seeks maximum shared value for each customer, by being specific to the value sought and received by that consumer, at that time, in that context. It reflects individual variations in need, value perception, willingness to pay, ability to pay, and all relevant criteria. It provides sellers with fine-grained, in-context "market" data for segments of one, that enable the sellers to fully understand market needs, and learn new ways to meet them, and to delight their customers, one by one. It naturally reflects broader considerations of shared social value beyond the individual customer, by sharing responsibility with the customer for the social valuation process. Buyers are free to consider whether a seller is socially responsible in the larger sense, and to factor that into their willingness to pay (to whatever extent they desire). What might have been an externality to the seller may be internalized by the buyer, so that the seller must internalize it as well. Social values shift from external constraints at odds with profit maximization to natural subjects of the value dialog with the buyer. It changes the equation from a zero-sum game of buyers shopping around for the lowest prices and sellers seeking to be the low-cost provider, to a win-win collaboration for achieving shared value. Instead of consumers seeing profits as coming at their expense, profits are framed as a valid and deserved sharing of their value surplus with a company that is a respected partner in value creation. This gives a new legitimacy to profit-seeking, as integral to collaborative creation of shared value. Traditional transaction-level pricing models foster a purely price-based race to the bottom, which makes it hard for a company to see at a micro-economic level how social responsibility to their customers and the larger public can benefit their bottom line, well intentioned as they may be. We can talk of shifting the view to long term profit maximization, but how do we do that? The ongoing, relationship-based structure of FairPay micro-economics directly considers shared value, at both the individual and larger level, in a way that removes the conflict. It aligns profit maximization for the firm with maximization of social value (at least as perceived by individual buyers). Thus Fairpay provides a new micro-economic mechanism to seek long-term profit maximization in ways that directly align with social value maximization. Where and when can FairPay fit in? It is most clearly applicable to businesses in which marginal costs are low. A major segment is in markets for digital products and services. Such markets already make extensive use of free trials, freemium models, and even pay what you want promotions. These markets already exploit the low incremental cost of producing additional (marginal) items, to give away some product in order to sell more in the future. FairPay can be introduced immediately, to do this in a much more economically efficient way. Some controlled level of zero-revenue transactions are accepted as a market learning cost, in order to discover what buyers are willing to pay and whether they are good partners. With FairPay, instead of "free" offers, the offers are value-based (but are similarly risk-free to the buyer). Similar immediate opportunities for FairPay arise in markets where physical goods and services are perishable (such as those currently addressed by Priceline's "name your price" model). As businesses and consumers get used to FairPay, opportunities to exploit it will expand. Turning the invisible hand to the broader aspects of shared value. FairPay naturally guides better economic efficiency, while significantly reflecting the broader context of shared value. When this new turn of the invisible hand gives consumers a say in pricing, social values will be served as just another corporate profit opportunity, not a "Corporate Social Responsibility" cost. Price efficiency and legitimacy: FairPay provides a structure for pricing that is dependent on buyer acceptance in a way that legitimizes differential pricing - to efficiently address varying value perceptions, usage patterns, and abilities to pay. Price "discrimination" becomes an equitable method for maximizing shared value when the buyer participates in the discrimination and accepts the rationale for paying more or less than other buyers. This can enable usage-based and other value-based pricing in ways that buyers can agree to and temper as desired (such as paying little extra for an unintended and atypical overage in usage). Many current markets are very inefficient because of consumer aversion to metering and other rate discrimination. "All you can eat" pricing plans have popular appeal to narrow customer interests, but their wastefulness and inequity will become very apparent when customers participate in pricing decisions. Disadvantaged markets: This buyer acceptance of "fair and reasonable price discrimination " also enables new ways to efficiently address low-income and disadvantaged markets at a profit (and social benefit). For example, it becomes clear that those who can afford to pay more than others should do so. Information and digital services that may expensive in high-value/high-ability-to-pay markets can fairly be offered far more cheaply in disadvantaged markets without cannibalizing the markets where buyers know they can and should fairly share their large value surplus. When treated as partners in shared value pricing decisions, consumers will recognize that companies should be able to profit more (and recover more of their costs) from those who can afford it than from those who cannot, and companies will be able to expand and differentiate their markets accordingly. Innovation and productivity: FairPay's individual dialogs about value give companies both the incentive and the market information needed to innovate to better serve existing and potential customers, and to communicate how they offer value to different customers. FairPay pricing dialogs will capture rich and detailed transaction level data on individual buyer value perceptions, needs, and desires. They can re-conceive products and markets, identify new needs, create efficiency, and expand markets, in a natural partnership with their customers. All of this can start now in markets that Fairpay is particularly well suited to: those in which marginal costs are low, such as for digital products and services, and for perishables. As such uses of FairPay develop, our concept of how to think and talk about pricing will change, and our understanding of business as a game of relationships, not just transactions, will grow. From there we can learn how extend the principals underlying FairPay to other markets, and perhaps develop similar models of relationships and of dialog about value that can work even for products and services where marginal costs are not low. We will enter a new era in capitalism as a way to collaboratively create shared value, guided by a new and broader sweep of the invisible hand. Sabers are rattling this week with the consideration of seemingly draconian measures to stop Internet piracy of copyrighted materials. The FairPay model for monetizing content puts this issue into interesting perspective. It suggests the way to end piracy is not to reduce the supply, but to reduce the demand. First, let's get back to basics. What is the real objective here? Copyright and ownership of intellectual property are not ends in themselves, but means to a larger end. This larger end, is clear in the Constitution: "To promote the Progress of Science and useful Arts, by securing for limited Times to Authors and Inventors the exclusive Right to their respective Writings and Discoveries." Thus copyright is clearly only a means "To promote the Progress of Science and useful Arts." It would be foolish to apply measures to protect copyright that impede "the Progress of Science and useful Arts" more than they promote it. The problem with PIPA and SOPA is that they seem to overstep the objective, and to enhance a means at potentially high cost to the desired end. The real issue is that the Internet has facilitated piracy to the point that it threatens the ability of creators of writings and other arts to earn reasonable compensation for their work, and thus threatens the progress we seek for society. If creators lack fair compensation, fewer will create, and society will lose. We (society) support IP ownership to the extent that it is good for society, not the other way around. So the challenge is to find better ways to ensure the fair compensation of creators for the good of society. The Internet is a tidal change, and we must learn to channel the tide, and harness it, not try to stop it. The ease and effectiveness of piracy relative to any issues of quality and risk. The ease and effectiveness of legitimate sources. Social and ethical factors relating to the legitimacy of the IP owner, and the fairness of stealing from them (stealing service, not bits). It is well known that the Internet has shifted at least #1 and #4 toward piracy. I suggest the real solution is not laws and other efforts to shift #1 (although some modest improvement may be gained), but to shift #2-4, and especially #4. The value of shifting #2 and #3 are well known, and summarized by Levine. What is less clear is how important #4, fairness, is. As described elsewhere on this blog, FairPay is a new model for transactions related to copyrighted content that lets buyers pay what they think fair, within limits. When buyers can buy legitimately for a price they accept as fair, the cost becomes a non-issue. Those who have limited means or get little value can still buy for a price that considers those factors fairly. When buyers can buy legitimately for a price they accept as fair, the fairness of piracy becomes clearly insupportable for all but the most sociopathic. It is hard to argue that "information wants to be free" (as in free beer), when it is free enough. Piracy is a tax imposed by the people on sellers of IP, a Robin Hood tax. When the price of content seems onerous, people feel they should not have to pay for it, and piracy appears justified. It is seen as noble for the poor to steal from the oppressive rich. As with any illegitimate product, it is generally easier and more effective to reduce demand, not to choke off supply. That is best done not by legislation, but by making the legitimate alternative more attractive. FairPay pricing is a significant step in the right direction, one that also supports the following steps. It makes prices more suited to individual buyers needs, values, and ability to pay. Copyright owners are given the right to extract "monopoly rents," but must balance that with the quid pro quo of society's desire to benefit from their creations. Making sellers more legitimate in the eyes of consumers is also a major factor. To the extent the IP owners are seen as evil and rigid, faceless corporations that exploit their consumers (and their creators), it is easy to justify stealing from them. Showing that they listen to consumers and can be flexible in pricing will greatly increase perceived legitimacy and deservedness. Getting sellers to be more clearly respectful of creators can also have a big effect. Many studios (such as music labels) are perceived as sharing little of their profit with their artists. While they do have real costs of nurturing, marketing, and managing, clearly the Internet is shifting that toward what Seth Godin calls "skinnier" models. IP aggregators must either get skinny, or demonstrate why they deserve the share they get, and be transparent about how much they share with the creators. FairPay is not essential to all of these levers, but it can contribute significantly to all of them. When buyers set prices, no man will be a pirate. That may not be true in every case, but it is true enough. An interesting NYTimes report by Nick Bilton talks about the Uber online service for ordering a car service, and how the workings of supply and demand can seriously disrupt customer relationships. The issue was a "surge pricing" feature that raised the cost of a ride to a New Years party, which cost $27 to get there, to make the ride home cost $135. Bilton nicely summarizes the issues in dynamic pricing. I posted a comment on that article suggesting that FairPay provides a solution to this problem -- a solution based on using the Internet to facilitate a relationship view of price negotiation, instead of a single transaction view. This post elaborates a bit on my comments, and highlights one of the major advantages of FairPay that make it more attractive and more economically efficient than conventional methods. The real problem of dynamic pricing (described in the article) is one that can now be fixed in a “post-modern” economy. The problem with dynamic pricing is that it is set unilaterally by the seller, and imposed on the buyer on a take it or leave it basis. This is also called price discrimination (and in some cases, price discrimination is actually illegal). But as Bilton says, such discrimination is economically optimal. That is why it is widely used in the hotel, airline, and car rental businesses. There buyers do live with it -- but still with considerable resentment. I suggest the way to make it acceptable to buyers is to involve them in the pricing decision. That is one of the key features of FairPay. FairPay sets prices based on a dialog with the customer, and uses Internet tracking of such prices to manage fairness over a long-term customer relationship. The long term relationship view is as suggested by Liran Einav (a Stanford economist) in the article). With FairPay, customers have significant participation in pricing, and can be asked by sellers to include a dynamic premium (such as for peak time surges) -- but they can decide just how extreme that premium should be. Sellers get to determine if the buyer is generally being fair about that, and continue to allow FairPay pricing in the future to those who are reasonably fair. True, few buyers might accept a price of $135, but many might accept $50-75 and some even more. The seller can also be more restrictive during peak times, offering surge period FairPay pricing only to those who who have a history of agreeing to a reasonable level of surge premium, while let less flexible users might be permitted to use FairPay pricing only during times of normal demand. Thus "discrimination" can be good, when done within reason, at agreed-upon levels, based on mutually understood reasons. Another factor in customer acceptance is predictability, as in the cited quote of Dirk Bergemann (economist from Yale). I suggest this is really a problem with unpleasant surprises, and with price changes that seem unfair. The perceived unfairness of dynamic prices and discrimination, such as with the New Year's surge, or for snow shovels or flashlights after a storm, is the "unfair" external imposition of higher prices. Here again, when the customer gets to set the level of dynamic premium, that changes it to a fair process. Of course dynamic discrimination should also apply in the other direction, to provide discounts at slow times, as well! That is an equal part of fairness, and FairPay can provide that too. When there is lots of supply and little demand, the customer should be given the freedom to set a lower price (within reason). FairPay brings that kind of sensibility back into pricing. The time-honored practice of individual negotiation allowed such issues to be factored in as appropriate and agreeable. We lost that in 20th century mass-marketing, but the Internet now lets us regain that in a new and better way. That is described more fully elsewhere in this blog, and the Web site. I suggest FairPay could be a very effective solution for Uber, and for many others like them. [UPDATE 8/1/16:] See additional comments in this newer post: Price Discrimination for the Good!